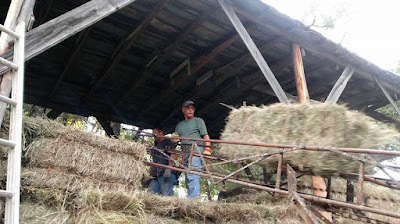 Father and son work the bale elevator. I remember haying. Prairie hay harvest has always been a big part of summer on the farm. 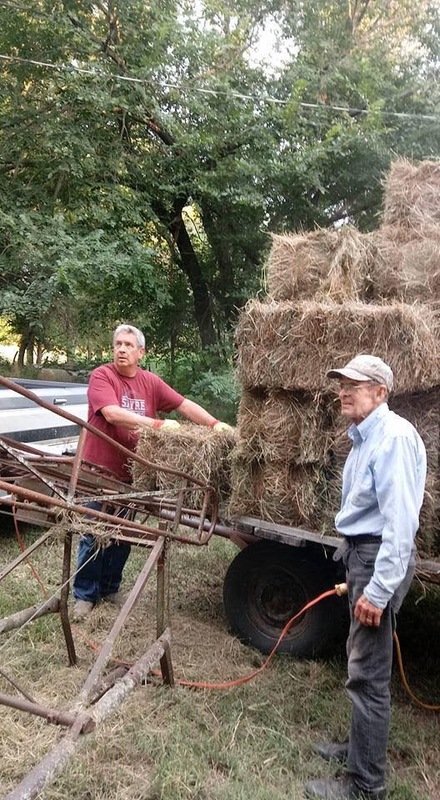 Meadows of prairie grass are cut, dried and baled to feed cattle through the winter. Grandsons and a son-in-law stack hay in the polebarn. 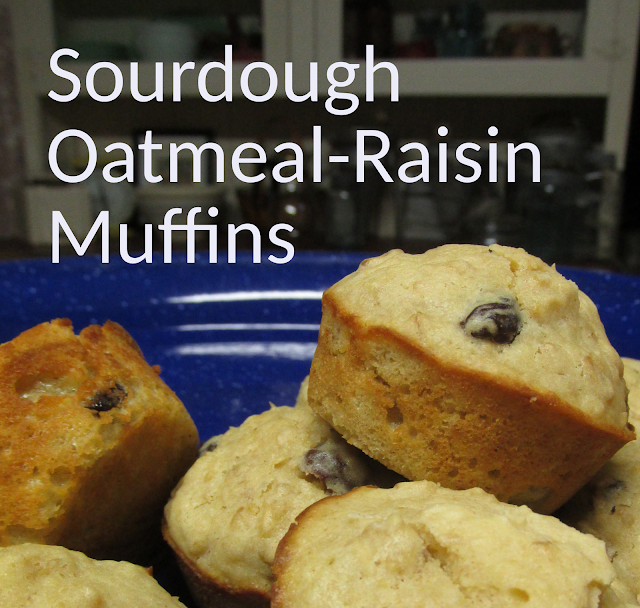 As a child, I helped my mom and grandma prepare "lunches" to take to the field where my dad, grandpa and perhaps an extra neighbor or relative or two were stacking hay on the back of a haywagon trailing a baler that was churning out heavy, oblong bales. 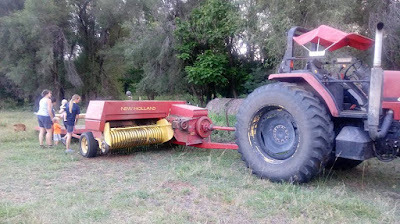 A neighbor, Wilbert Regier, drove the tractor in front of the baler which had a jaunty umbrella to give him a bit of relief from the blazing heat. There were other haywagons waiting in the field and when one had been stacked with precision and filled, another one would be hitched behind the baler and the baling would continue. 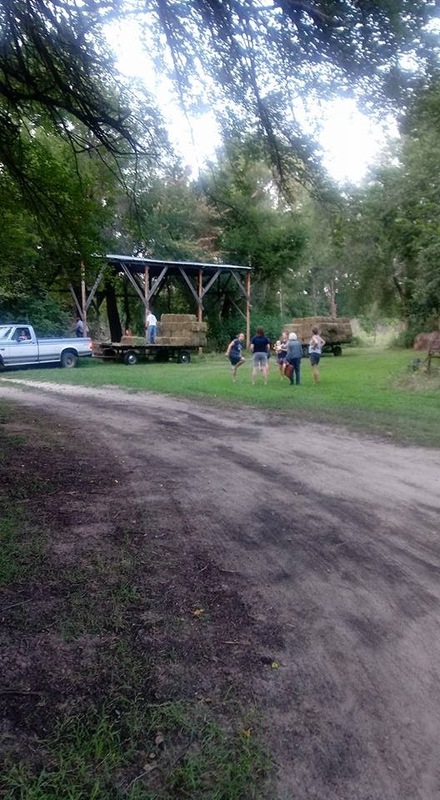 Dad hired an Amish gentleman and his equipment to bale his hay this year. They stopped for lunch about 4 p.m. and the menu was always the same. We served sandwiches made with ground bologna and boiled eggs mixed with mayonnaise and sweet tea which grandma made by mixing two teaspoons of instant tea and a heaping cup of sugar into a pitcher of water. This was not as simple a process as you would think and mom would give a subtle sigh as the dishes stacked higher and higher as grandma managed to use nearly every dish in the kitchen. 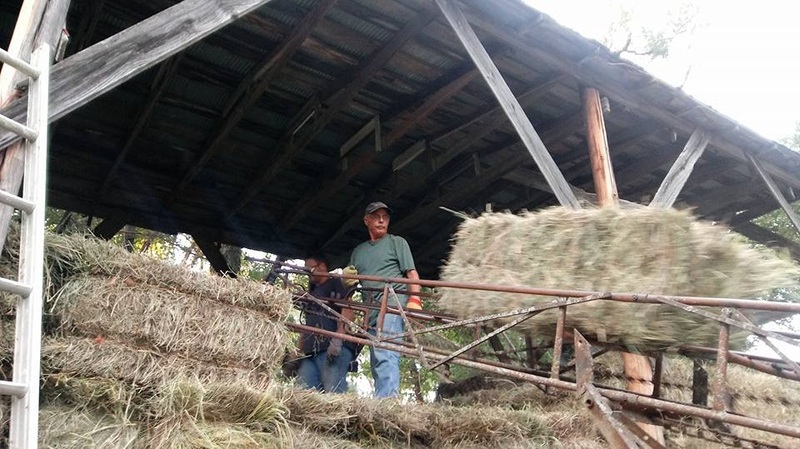 The bale elevator is a bit finicky, slightly dangerous and can handle only one bale at a time. 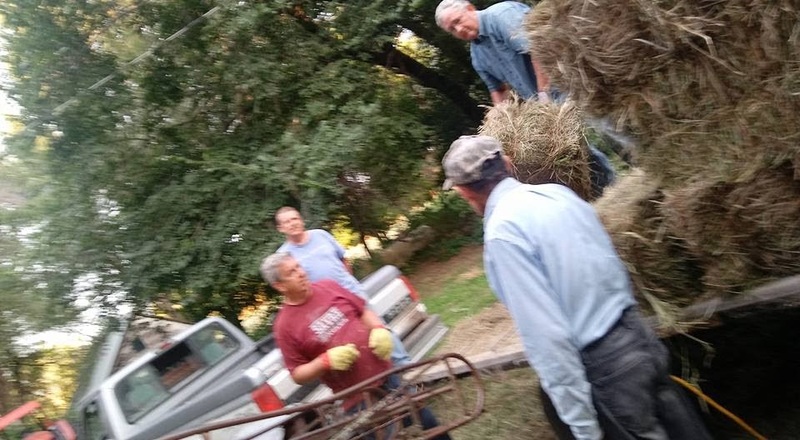 Grandpa had cut and raked the hay using his team of horses and was inevitably stung in the hayfield by a wasp adding to the stress of the event. This does not make me nearly as old as you would think because Grandpa did not come willingly into the 20th century and used horses for farming long after most farmers had updated to tractors. After several years of shortage of help, it was good to have lots of hands this year. Back on the farmyard, the wagons were unloaded and the bales were stacked on the ground onto square towers 10-12 feet high. 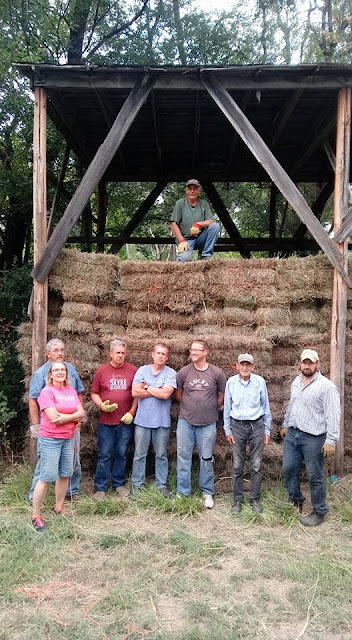 Young men would toss heavy bales high up to the top of the stack. If it was timed right, they unloaded the top of the wagons to the top of the stacks. 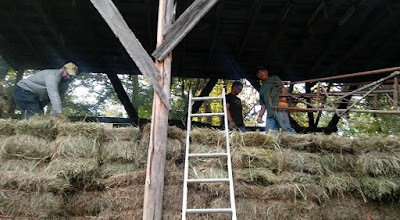 The stacks were covered with loose hay which was pitchforked up giving the stack a rounded roof. I probably don't have to tell you that the whole process was exhausting, backbreaking work usually in unrelenting heat and often at the mercy of unreliable equipment and inclement weather. Cooler temperatures and beautiful days were wonderful gift for this last harvest. Many years have passed. Some things have changed. Some have not. Two constants have been my dad and oblong bales on haywagons. The next generation may not get to buck bales. All of the adults mentioned at the beginning of this story are now gone. Except Dad. Dad turns 87 years old today. He says this is his last hay harvest. It is time to stop. Over the years he has been assisted by his sons and daughters, his sons-in-law and his grandchildren. On this last hay harvest most of them returned to help. There was also a swarm of great-grandchildren too little to help but enthusiastic in their observations and support. The Thursday evening crew surrounds their patriarch. It's still exhausting, backbreaking work at the mercy of unreliable equipment, but this year we got a bit of a break from the heat. And really, with so much help, it wasn't too exhausting, either. That can't be said about recent years so it makes this year a little more special. Elise, right, learned a thing or two about bucking bales this summer. 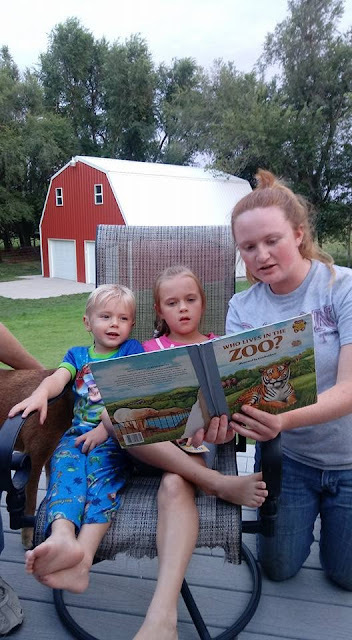 We're excited that she is moving to Kansas and will help Dad feed cattle this winter. As we close the door on a long standing family tradition, I'm surprised to feel a little misty-eyed. It's been hard work, mostly shouldered by my hardworking father. What an example of diligence and perseverance! Thanks, Dad! And happy birthday! Next up is one more winter of feeding cattle with the assistance of a young lady from New York. Happy Birthday Sir, you are an example of hard work and dignity. This type of life I love. 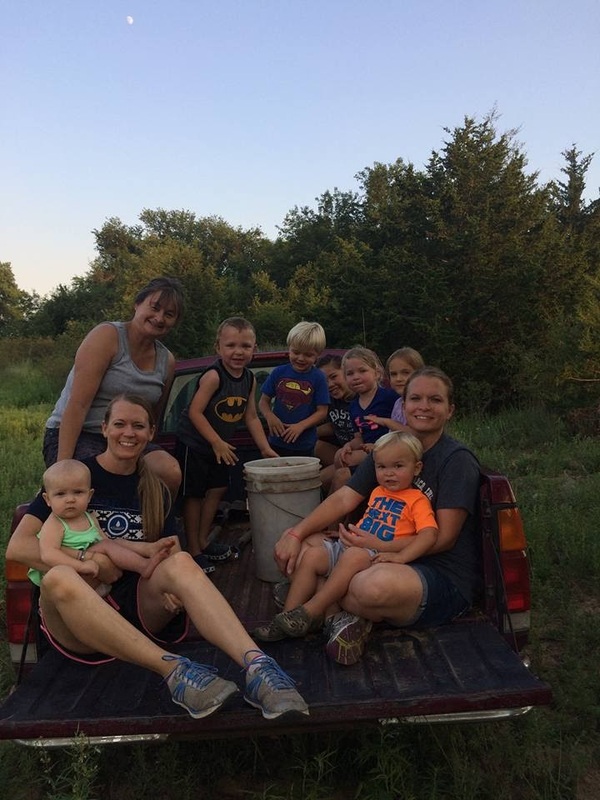 A whole family, a country side life free from the bustle of city life and pollution, thank you for sharing this post. We must have such more posts.